Four months ago you left me. Remain as fresh as this morning’s paper cut. If this finds you grieving today, the keen sharpness of fresh grief, in my experience, does dull in time. I do not promise it departs, but the intensity does soften a bit so one can move forward again. The second anniversary of Steinway's death was much better than the first, which was somewhat better than the four-month mark described in the poem above. More importantly, the grief itself opens the way to know our Lord in a deeper way as the Holy Spirit Jesus promised in John 14-16 comes alongside us and the Father of mercies comforts our afflictions so that we in turn are better able to comfort others (2 Corinthians 1). Ultimately, comfort is not a thing or a feeling but a Person, the Lord God Himself indwelling His children. May this loving Lord make His comfort real in your experience as He has in mine. "Generally, by the time you are Real, most of your hair has been loved off, and your eyes drop out and you get loose in the joints and very shabby. But these things don't matter at all, because once you are Real you can't be ugly, except to people who don't understand" (The Skin Horse, from The Velveteen Rabbit). The summer of 1993 marked the middle of the most difficult season of my life to that point. Two years prior, a difficult decision I believed to be right and obedient had proved even more costly than I had imagined. Some of the cost was inherent to the decision, but I no doubt increased it by my lack of skills, maturity, and courage to handle the ensuing conflicts. I sought comfort for my grief and shame in food, sleep, Scripture, spiritual reading, and desperate prayer (sometimes in that order), even while trying to reassemble the shattered dreams with duct tape and ingenuity. 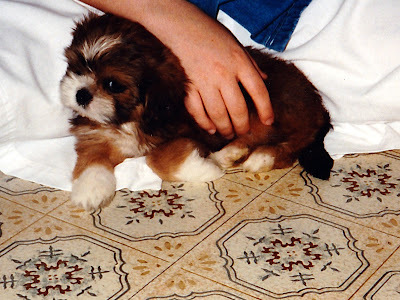 By that summer, I was almost out of duct tape and ideas, and I decided with my parents' support that the next step was to buy a dog. At the time I was living in my old room at their house, no longer enrolled in college, and working at temporary clerical jobs and babysitting, yet somehow it seemed perfectly reasonable to spend more than a week's wages on a purebred Lhasa Apso. A male one, to breed with my sister's dog, Muffin. After weeks of scanning classified advertisements and making phone calls from the breakroom at lunch, just before July Fourth we found a good prospect in Oak Cliff, a good drive southwest of us. The one snag was that I already had a childcare commitment after work that night, there were only two males in the litter, and we had learned from experience that the males sold most quickly. My kind and longsuffering parents agreed to drive out to the breeder's house with check in hand, examine the candidates, and act on my behalf. The babysitting evening is a blur in my memory, as all I could think about was whether my parents were meeting and picking up my dog. When I arrived back home, the lights were still on and the kitchen was full of my parents, youngest sister, her dog, and a tiny brown ball of fur who fit in my two hands. He nestled in my lap immediately, and I was so smitten I hardly even minded the flea bites. After much deliberation, I named him Steinway. 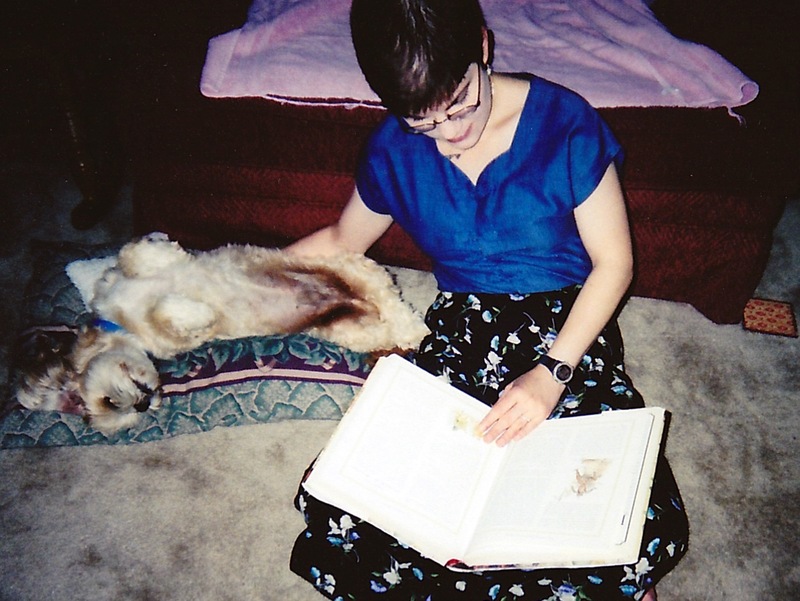 For sixteen years, he was my most constant creaturely companion. Friends came and went; my sisters moved into their own places and one married; I met and married Allen and exchanged my parents' roof for his; but Steinway loved me without reserve or qualification through it all. He had no job to take him away during the day or move him to another city, no competing interests except the squirrels on the lawn or the occasional Nylabone. From him I learned the power of presence, the importance of "with." As I put aside the salvage attempts and sat among the shards, he let me cry into his fur and didn't even seem to mind. He curled up on the dining room chair next to mine, whether I was up at 4 am or midnight studying. When I left, he waited for me at the front window or atop the back of the sofa, from which perch he could see both entrances. When illness woke me in the night, he found me and kept me company, and I did the same for him. He was my Velcro dog, sticking by me through whatever came. Throughout his life he made visible to me in an almost sacramental way the invisible, constant, loving presence of Christ. I did not always love him wisely, but I hope I loved him well. His companionship and puppy needs were a gift from God to turn my focus outward again, and God brought his affection to begin to heal my hurting heart and give me many years of joy before his departure broke it again. The memory of his fur and weight is still imprinted on my arms. He helped me live through the brokenness, rubbed off some of my sharp edges, and taught me that Real is more beautiful than "carefully kept." For sixteen years we loved the fur off each other; because of Steinway I am that much closer to Real. Yesterday's post on a happy encounter with a young neighbor was already written and scheduled when we, along with the rest in the crowded pews, received the unexpected and rather traumatic news of the departure of a long-serving pastor. Then I read Jonah's story from my daily portion yesterday and realized being swallowed by the big fish at the end of chapter 1 was the best thing that happened to Jonah that day. Normally, ending up in the belly of a fish would be bad news, yes? In Jonah's case, however, the fish rescued him from drowning (see his prayer in chapter 2) and provided a needed course correction, namely express delivery to God's chosen destination with none of those pesky weather delays or security lines. just as a father, the son he delights in (Proverbs 3:11-12, HCSB). Like it or not (mostly not, to be honest), even the unpleasantness of life--the apparently unanswered prayers, the radical course corrections, the being allowed to face the consequences of our sin, the times God does in fact tell us to go weed the garden--equally signifies His love and delight in us. He only trains up and lays down the law, so to speak, for His own kids. When those not-so-delightful seasons come, I can easily begin to view my Father as my enemy, to let the pain keep me from Him who could have prevented it. If I hold fast instead to His promise that even these "waves and billows" are marks of His love, that trust opens my hands and heart to begin to recognize His presence in the trials. He never forsakes His children; He has promised that (Deut. 31:6; Hebrews 13:5), but only trust has eyes to see the answer to the promise. God's real answers to prayer are often seeming denials. Beneath the outward request He hears the voice of inward desire, and He responds to the mind of the Spirit rather than to the imperfect and perhaps mistaken words in which the yearning seeks expression. Moreover, His infinite wisdom sees that a larger blessing may be ours only by the withholding of the lesser good which we seek; and so all true prayer trusts Him to give His own answer, not in our way or time, or even to our own expressed desire, but rather to His own unutterable groaning within us which He can interpret better than we. Your Father delights in you. May He open your hands and heart, and mine also, to receive His delight by faith when we don't feel it in experience. One evening last week, Allen and I returned from a brief outing at the same time as our neighbor returned from work. We exchanged greetings and let him know we'd referred a family member to his business. Then he asked if we wanted to see his toddler, "Olivia," who was in the truck, too. Of course, we did. We stepped across to their driveway while he lifted her out and set her down. As she found her balance, he said, "Livvy, do you want to say hi to Allen and Christina?" She sized us up and then focused on me, down on one knee, and began trotting toward us. Given the slope of the driveway, she picked up speed along the way until finally throwing herself into my arms. "What a good hug, Livvy. Did you have a good day at school today?" "Actually, she went to her grandma's today," her dad amended. I relaxed my arms, but she was still holding fast, so I relaxed into the moment instead, stroking her back and memorizing the vaguely fruity scent of her tousled curls. What's that feeling tugging at the corners of my mouth? Oh, yes, I remember. It's delight. "What did you do at grandma's? Did you dance? I know what a good dancer you are." "What else...did you take a nap for grandma?" "Did you...play outside? Kind of hot for that, though." "Are you really answering my questions, or are you parroting everything I say?" She kept hugging my neck a few minutes longer, then sat on the drive and on my lap while her dad talked with us about the city's basketball celebration. After high fives all around, she decided to swing, and her dad decided it was time to go inside where her mother was waiting. The spell was broken. This small person gave me the gift of a few minutes of concentrated, spontaneous affection, and with it came joy. I had no candy or presents to offer her; she was not, as far as I know, trying to escape an unpleasant chore; she wasn't even sad and seeking comfort. She simply wanted to give and receive love. How did I respond? I didn't push her away, saying, "Livvy, this is not the time. Can't you see those weeds around the live oak? Get to work." Her affection pleased me to receive as much as it pleased her, evidently, to give. In my mind's ear afterward, I heard the word of the Lord saying, "If you, then, being evil... how much more your Father in heaven...?" Can it be that my heavenly Father, just like my earthly one, doesn't care as much about my lists of duties and reading and prayer requests and getting stuff done as I do? as He does my spending time with Him, in His Word, prayer, and worship, without an agenda, but just for the pleasure of each other's company? Can it be that the God of the universe even takes pleasure in my company? Can it be that the commands to learn and keep His Word and to pray are not only good for me in an eat-your-vegetables kind of way but as a means of being close to each other? He will delight in you with shouts of joy (Zeph. 3:17, HCSB). He brought me out to a wide-open place; He rescued me because He delighted in me (Ps. 18:19, HCSB). You will be a glorious crown in the LORD's hand,and a royal diadem in the palm of your God.You will no longer be called Deserted,and your land will not be called Desolate;instead, you will be called My Delight is in Her,and your land Married;for the LORD delights in you,and your land will be married (Isaiah 62:3-5, HCSB). Jesus answered, "If anyone loves Me, he will keep My word. My Father will love him, and We will come to him and make Our home with him" (John 14:23, HCSB). This week I personally need to revisit the practice of delight and celebration and reorient my practice of spiritual disciplines (which are primary means of experiencing His love and delight) around the starting principle that He loves me and wants me more than my agenda, even if it's an agenda I thought I'd received from Him. May the Lord grant us grace this week to rest, even if only for minutes stolen from pressing responsibilities, in His loving embrace. May His delight in us strengthen and sustain all our obedience by adorning it with joy. ~the Lord's grace in blessing broken, fragmented lives offered to Him and in using that very brokenness to nourish others. ~prayers not granted: "Did God sometimes not withhold in mercy what we ask, we should be ruined at our own request" (Hannah More, via challies.com). Two of my closest friends have lost their fathers in recent years, and three other women immediately come to mind whose fathers have died in the last year. Many more, some I know and most I don't, have damaged or broken relationships with their earthly dads. If for whatever reason this Father's Day is marked by more pain than celebration for you, our heavenly Father, the One who counts stars, hairs, fallen sparrows, and tears, knows your grief. May the Father of mercies comfort your sorrow with reminders of His love today. "Now may our Lord Jesus Christ himself, and God our Father, who loved us and gave us eternal comfort and good hope through grace, comfort your hearts and establish them in every good work and word" (2 Thess. 2:16-17. ESV). Minstrel and lay* – be all Thine own. Last week a reader asked, "What do you do when you hear those [encouraging] words – but they go right through you as if they were never said – that would be my question – when you can't hear the positive what do you do?" Ruts so deep even kind words fall in. The hairdresser calls her beautiful, and she thinks, "She's just saying that so she'll get a better tip." Her husband tells her she looks pretty, and she thinks, "He knows how much time I spent on my makeup and hair and that I changed clothes six or seven times. He's afraid I'll be in a bad mood for our date." "Your appearance determines your worth." "If you let them into your thoughts, they won't like you." And do you know what? Those last two are true, but they are only part of the truth. The Bible says, "For all have sinned and fall short of the glory of God" (Romans 3:23, HCSB). The very next sentence continues, "They are justified freely by His grace through the redemption that is in Christ Jesus" (Romans 3:24). The sins and shortcomings that the father of lies says disqualify her actually are actually the prerequisites for God's grace (see Romans 5:6-8). Every time the girl chooses to believe the truth instead of the lie, another shovelful of dirt is scooped out of a new rut and the old one fills in just a little bit more. "There is therefore now no condemnation for those who are in Christ Jesus" (Rom. 8:1). One. "You are loved with an everlasting love" (Jer. 31:3). Two. "I praise you, for I am fearfully and wonderfully made. Wonderful are your works; my soul knows it very well" (Psalm 139:14). Three. One shovelful at a time, minds are transformed and renewed through Word and Spirit. *The rut image comes from Holley Gerth. Recognize the lies I'm believing. Vague feelings of accusation, rejection, and worthlessness are never from God. They are contrary to His character as revealed in Scripture and in the person of Jesus Christ. Reject those thoughts as the lies they are. Replace them with God's truth and ruminate on it. Some Bibles have a topical index that can help in finding applicable verses for particular needs. Sites like biblegateway.com have key word search options. Asking an older Christian is also a tremendous resource to help locate the truth opposite to the lies. This is one more benefit to practicing Scripture memory; every repetition of truth digs the new mental rut a little deeper and fills in the old one just a little more. Rely on the truth. At some point, when I have recognized the lies and located the opposite truths, I must choose which to believe and which to act upon. If I have been withdrawing from Christian community because of lies I have believed, I need to repent of that behavior as well as the false belief that prompted it. The same goes for making faces and sarcastic quips to deflect compliments, but maybe I'm the only one here who does that. Again, Christian family and/or friends can support us in this process. When Allen catches me shrugging off his kind words, he sometimes calls me on it, gently but firmly: "I said, 'You look pretty.' Are you calling me a liar?" Without that kind of accountability, lasting change is even more difficult. Free download of the "Kick Out the Lies" Webinar offered by Holley Gerth and Denise Martin June 9, 2011; Holley also has a new book on similar themes (to be released soon). Post script: Some commenters have contributed additional insights and helpful resources. If it has not been your habit to follow the comments, I encourage you to take a moment longer to do so today. Cheeky bird can't even be still long enough to eat! God wanted to make known to those among the Gentiles the glorious wealth of this mystery, which is Christ in you, the hope of glory. In the darkness and the light. To find strength for every thorn. Father, fill us with Your life. May Your Holy Spirit make us more like You. Now to him who is able to do immeasurably more than all we ask or imagine, according to his power that is at work within us, to him be glory in the church and in Christ Jesus throughout all generations, for ever and ever! Amen (Ephesians 3:14-21, NIV1984). In this unusually severe tornado season, tales of storm cellars abound. One of A. 's colleagues was sheltering in hers while high winds blew the side off her barn. She lives farther north in our own county. A news story reported an entire neighborhood's 14 people and six pets finding refuge in the sole storm cellar on the block. Another story featured a company which constructs storm cellars and steel-reinforced safe rooms in homes. In this region where basements are few and far between, the proprietors have more business than they can handle. Plus a waiting list. When I hear these things and the severe weather season is far from over, I am tempted to envy, to covet those secure hiding places for when the lightning cracks and wind howls in the middle of the night. I think to myself, "If we ever build a custom home, we should have one of those." "If we had a storm cellar, we would be safe from tornadoes." The name of Yahweh is a strong tower; the righteous run to it and are protected (Proverbs 18:10, HCSB). The HCSB Study Bible informs me that cities in the ancient Near East often included a tall tower like a fortress in the center of town. When enemies threatened, the whole town would throng to the tower and shut themselves inside. It was a storm shelter of sorts, for a different kind of storm. The study notes also remind me that "name" in ancient times denoted a person's whole character, his essential nature. So why would the name of Yahweh, Israel's covenant God (and the Christian's), why would His "name" provide safety from danger? Then the LORD came down in the cloud and stood there with him and proclaimed his name, the LORD. And he passed in front of Moses, proclaiming, “The LORD, the LORD, the compassionate and gracious God, slow to anger, abounding in love and faithfulness, maintaining love to thousands, and forgiving wickedness, rebellion and sin. Yet he does not leave the guilty unpunished; he punishes the children and their children for the sin of the parents to the third and fourth generation" (Exodus 34:5-7, NIV). Compassionate, gracious, slow to anger, abounding in love and faithfulness, maintaining love to thousands, forgiving wickedness, rebellion, and sin: if the mighty God, Creator of the ends of the earth, is also all of these things, surely He is a safe place for us. The last bit makes me squirm a little, but when I am the one under attack, when someone is guilty of sinning against me, God's promise to punish the guilty gives comfort. By the same token, when I'm the guilty party, as is more often the case, it cautions me to revere and respect God and flee back to Him to receive the grace and forgiveness He promises. It should also teach me to pray for those who sin against me, that they also would seek and find His grace and forgiveness. A dugout shelter or steel-reinforced room are not ultimately what will give me the safety I long for. The LORD God is my only real security, and He can keep me safe with or without those means. If He provides them one day, by all means I will thank Him and use them, but for now it is that revelation of His character which I will wrap around myself in the middle of the night. By the same token, if He wishes, He can allow the storms to strip me of everything but Jesus, and He can do that with or without a storm cellar close at hand. May He protect you and me both, dear Crumble, from such a test, but if He asks it of us, even there He will be our strong tower. Only the certainty that He is compassionate and gracious, abounding in love and faithfulness, forgiving, altogether good, only that truth will be the refuge to keep us safe through the valley of shadow. Lord, I believe; help my unbelief, for Jesus' sake. Amen.